The Guitar Collective Tour brought its energetic, blazing-fast riffs and shreds to the Riot Room in Kansas City, Mo., Thursday, Nov. 29 and it was nothing short of spectacular. The show shined a spotlight on guitarists and guitarists only, featuring Angel Vivaldi and Nita Strauss with special guest Jacky Vincent. The show kicked off with England-born guitarist Jacky Vincent, formerly of Falling in Reverse and currently with Cry Venom. With no bells or whistles, Vincent came to the stage just one man and one guitar. He put on a clinic of guitar mastery to a prerecorded band track and without a shadow of a doubt he can rip it up on the axe. His style influences can be heard from Vinnie Moore to Dragonforce and will leave you mesmerized with his accurate picking style. I look forward to seeing him solo with a full elaborate show. Next on stage was the hurricane herself Nita Strauss. The Los Angeles musician is likely one of the most well-known hired guns in the business and is blazing a path to certain legendary status. 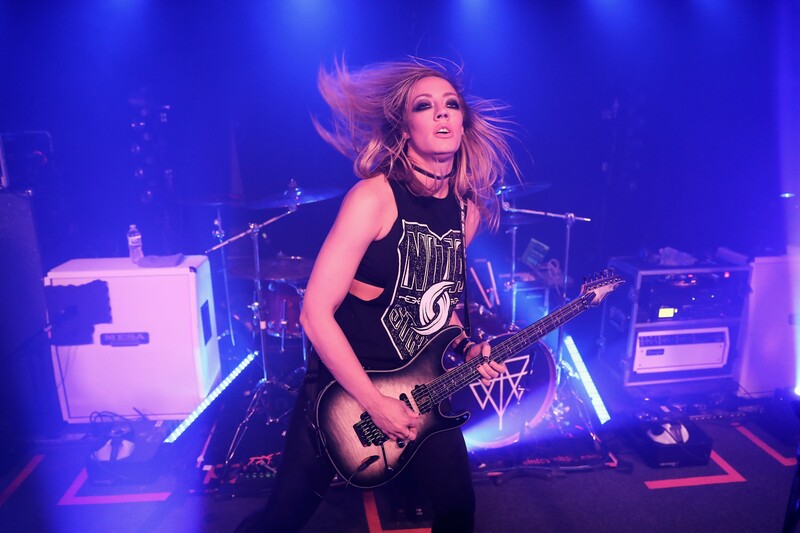 Her work ranges from the only endorsed all-female tribute band the Iron Maidens, the powerhouse tribute band The Starbreakers, and her most recent work making the icon Alice Cooper shine as his hand-picked replacement for Orianthi. After her successful Kickstarter campaign to help with her debut solo album and the recent release of “Controlled Chaos,” Strauss brought an excitement and energy to the venue that could be felt in the air as the line started to gather at the door. Strauss wasted no time setting the bar for the night with a full band, lights and fog along with a flair and style unmatched in anything I’ve seen before. It was my first time having the pleasure to enjoy her live and I was blown away. Strauss has a style that is addictive and her music is heavy metal. Hearing tracks live from “Controlled Chaos,” they prove to be on one of the rock Albums of the Year. While some artists tread the line with instrumentals and run the risk of being bland or boring, Strauss is the exact opposite. Each original song is performed with perfection and is a hair-flinging, horn-throwing dish of musical greatness. Strauss brings life to the stage and her songs, with talent recognized throughout the music industry as what you want in a guitar player. During her first journey as front of her own band, she attacked it and harnessed all the power wanted for a mind-blowing rock show. She made sure to pay homage to Alice with her rendition of “18” and brought some deep emotion to the stage with her salute to the one and only Jill Janus, her friend and fellow Starbreaker. Strauss showed she is on a path to absolute greatness and will be nothing short of an icon herself. Following such a talented guitar player is no easy feat, but Angel Vivaldi is no joke on the guitar and might be the only one capable. Vivaldi, of New Jersey, is a songwriter, producer, environmentalist and philanthropist known for his virtuoso guitar playing and the many charities his talent has afforded him to impact. Catching Vivaldi live is truly a moving experience. The talent is beyond what can even be imagined and it’s no surprise when you feel the energy Vivaldi puts off with his music. It’s inspiring to say the very least as he seems to defy reality with his guitar playing and songs that move the feet and fill the soul without even a lyric. The night ended with the three guitar players in an all-star jam fest that showed their talent, humor and willingness to make each other shine and was alone worth the price of admission. Each musician made the effort to shake hands and take selfies with every fan after the show. The VIP meet and greet with Nita Strauss and Angel Vivaldi before the show was a special experience. It included an intimate moment when Strauss and Vivaldi took questions from the crowd and discussed everything from tips to be a better player, memories together, and styles of play. The Guitar Collective Tour goes through the end of the year and is a must-see. Nita Strauss’ debut album “Controlled Chaos” is available on all streaming devices. During her set, Strauss unveiled a guitar with the initials JJ on it in honor of Jill Janus. Janus took her own life in August and was close to Strauss as the lead singer of the Starbreakers. In honor of Jill Janus and a friend I lost this night, I’d like to tell everyone you are loved and needed. If you feel lost, please reach out — suicide is preventable. Text CONNECT to 741741 in the United States. Great review! Looking forward to this show!